Tokyo Regional High School Karuta Champions. Episode 12 was a nice little interlude on the way to the National Championship at Omi Jingu. It showed the team looking forward to the Nationals, while those around them were mostly indifferent to their success. In particular how Chihaya’s family reacted, and the mini plot with the Empress, were nicely handled. Plus Kana-chan had an adorable moment. 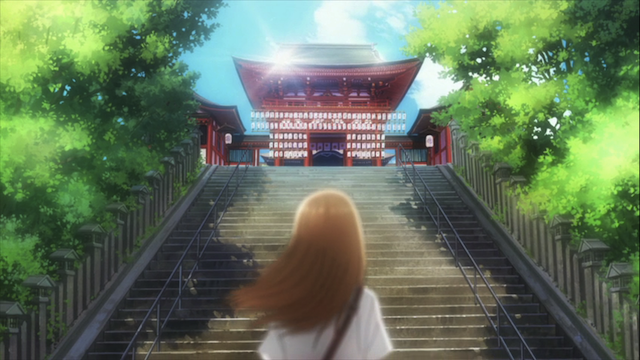 With all of that, the episode still managed to bring us literally to the steps of the Omi Jingu shrine. Chihaya at home takes a seat in the back while her parents cheer her sister on. The Karuta club’s advisor, AKA “The Empress”, seems indifferent to their success at the Regional tournament, and she assigns a similarly uninterested teacher to accompany the club to Shiga prefecture for the National Championship. 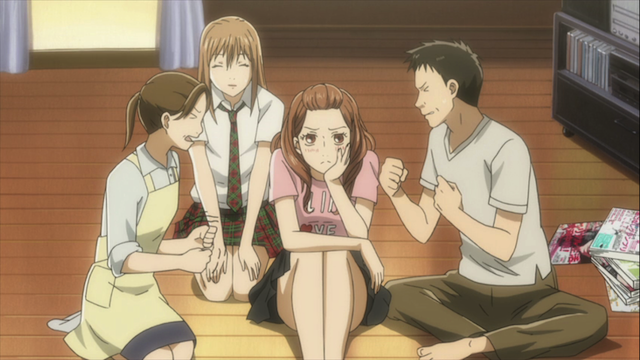 Meanwhile, at home, Chihaya’s family seems completely unaware of her victory. Instead they fuss over Chihaya’s older sister and her career as a wannabe celebrity. Fortunately by the end of the episode Chihaya’s efforts are recognized by her parents and the Empress, who decides to accompany the club herself. Kanade Oe and Chihaya Ayase. Poetry fans the flame of the human heart. I really enjoyed Kanade’s tantrum about not losing sight that the cards are really poems. And I’m sure her passionate affinity for the poetry was an important part of why the Empress, who overheard her spontaneous recitation, came to view Karuta as intriguing. Another reason was clearly the dedication that the club was showing in their play. The Omi Jingu shrine in Otsu City, Shiga prefecture. Finally they chose to end the episode at a great point. The club has already arrived at the Omi Jingu shrine. Now I’m really excited to see what happens. This is the point we have been heading towards since the first arc (the formation of the club) ended. Will they take the entire second course (the next 12 episodes) to tell the tale of what happens at Omi Jingu? Will Arata be there, and if so, as a player, or just a spectator? One of the things I kind of enjoy about this series is how things move at a good clip. Unlike a lot of other game/sports series that inundate us with training sequences, this one just gets past that with the goal of aiming for some good action in the tournaments. The bad part of the pacing: I do wish they took more time to delve into the sisterly dynamic and how Chihaya’s sister gets more of the attention. That part could have been explored further, but that’s a minor deal next to the general excellence this series has served up. Yes. I was glad they returned to that aspect and explored it a little bit in this episode. I had expected to see more of Chihaya’s family up to now. On the other hand, I always get the feeling that the producers know just what story they are trying to tell. That is one of the things that I enjoy so much about the pace. I always get the feeling that the producers have planned it out so they can tell their story, and they know they don’t have time for distractions. As you said, many shows, especially sports or battle shows have these interlude or build-up episodes on a regular basis. Once Chihayafuru got the team together, it has been moving at break neck speed. The obvious comparison from earlier this year was Blue Exorcist. They promised a battle against evil, and then immediately slipped into school life hijinx. Plots revolved around getting to know the heart of the demon (through cooking, cat nip, or just being nice to the Kracken). think almost any other show would have taken a whole episode for comedy/fanservice and “character development”. 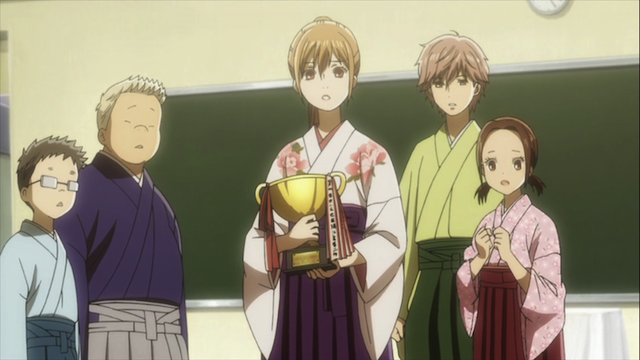 Instead Chihayafuru has never lacked for character development (even growth) while pushing the plot forward, and still had time for laughs along the way. Very impressive. Yeah, a lot of series would have devoted a whole episode to Chihaya’s family coming to realize they’ve been ignoring their youngest and finally giving her the attention/credit she deserves. This one manages to give you all the good feelings that would evoke without actually spending all the time on it and slowing down the plot. You’re right, these writer’s khow exactly the story they want to tell and exactly how to get there. This show amazes me on a weekly basis. For not ordinarily being a “slice-of-life” kinda guy, this show and “Hanasaku Iroha” have both just bowled me over. I’m sure you are right about the family respect story usually taking up an episode. The downside is that it is going to raise the bar for other shows. I have a feeling I am going to be more critical of the typical pacing when watching shows in the future. One of my favorite parts about Chihaya is that she’s doesn’t get angry, jealous, or try to steal attention from her family but actually supports her sister and her goals. You can clearly see she was dejected and wants some of that attention for herself (shown by her walking out of the room and thinking what she wanted to say). But she didn’t whine or cry or start a fight. That’s what makes her such a wonderful character, that she is able to deal with these problems at home but not let it affect her so that she becomes a worse person. And it made it that much better when she opened the newspaper, realized something was clipped and found her own book. I was elated. I’m guessing you and most others had similar thoughts with that seen, too. Yeah, I didn’t anticipate that her dad found the photo. It was nice to see her get some recognition from her family. I agree she is full of pluck. It is not that she doesn’t let things get to her. She definitely has mood swings. But she fights on, even when she faces a challenging situation. Yes, philosophical clash over karuta was interesting. Nikuman isn’t really into the poetry, but to him, it is a sports like tennis. He enjoys tournament to win. While Kana is a classic poetry fan, having extended knowledge of Manyoushuu also. She is indeed a waka-otaku, just like we love anime so much as anime-otaku. And poems she loves is romance, just like I love romance anime, which Chiyahafuru still hasn’t got into that much. Does she have a romantic feeling toward either of them, Arata or Taichi? We’ll see. All of the romance in Chihayafuru has been from Taichi’s perspective. I think Chihaya doesn’t have (conscious) romantic feelings for either boy at this point. It is possible to describe her attitude towards Arata as *unconscious* romantic feeling, meaning that it isn’t really love (and certainly not self-aware love), but that her mental image of Arata is larger than life, and his distance evokes in her a sense of longing to be with him. I don’t think that would naturally become a loving relationship if they were to meet in person. I’m not saying it is impossible, just that she probably isn’t thinking that way. If a full-fledged love story breaks out, something will probably have to happen, like one of the boys directly confronting Chihaya about their emotions. To get through to her will likely require an unambiguous confession.